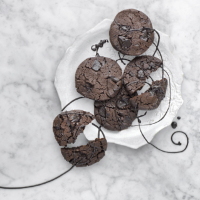 Crisp and crackled on the outside, soft and fudgy in the centre, these cookies are the ultimate chocolate hit. 1. Melt 150g chocolate in a bowl set over a pan of barely simmering water (or see the How to Cook With Chocolate page for other melting techniques). Remove from the heat and cool briefly. 2. In a large bowl, cream the butter and sugars for 3 minutes, until light. Beat in the egg, treacle, vanilla and melted chocolate until incorporated. Mix the dry ingredients in another bowl, then beat into the mixture with another 150g chopped chocolate until you have a smooth dough. 3. Transfer to a large sheet of parchment paper and mould into a rough sausage shape about 40cm long. Wrap loosely in the paper, tie the ends and chill for at least 1 hour. The dough can be kept chilled for up to 3 days and frozen for up to 3 months. 4. Preheat the oven to 190˚C, gas mark 5. Cut the dough into 1cm-thick rounds, then spread them on a parchment-lined baking tray (you will need to bake them in batches, about 6-8 cookies at a time). Bake for 10 minutes, until cracked but still soft. Leave to cool on the tray for 10 minutes, then transfer to a wire rack. 5. Spread the cookies over a large sheet of parchment. Melt the remaining 100g chocolate (as above), then drizzle over the cookies. Leave to set for 10 minutes.